When it comes to super-beings, almost every power has been done. At some point, comic book writers gave up and started using the same powers over and over again. Let's review the five most worn-out superpowers. 1. 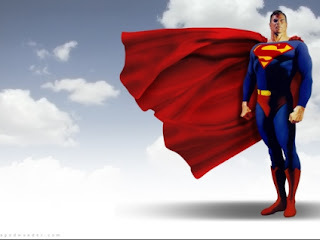 Superstrength - The definition of this power is pretty obvious - you're stronger than normal. Of course, the range of strength varies wildly, from a hero who's just slightly stronger than a normal human like Captain America to someone who can literally lift mountains, like Superman. Either way, super-strength is a power that's so common that it might as well be considered the default power in super-beings. When you describe a superhero, you should be able to say, "he doesn't have superstrength" rather than that he does. I think this power has become so common that it's kind of like an arms race. There are so many muscle-bound heroes and villains running around that any new hero or villain would almost have to have super-strength just to keep up. Plus, it never gets old to see someone pick up a car. But I would like to see more heroes with normal strength. He or she would have to rely more on brains than brawn. 2. Flight - Humankind has always dreamed of being able to fly. That's why the power of flight is incredibly popular with super-beings. That, plus the fact that it makes it easier for superheroes to get from place to place. More dramatic than saying, "Doctor Nightmare is attacking downtown! Where'd I park my car?" The trouble with flight is that it's not much of an offensive weapon, so usually it's a secondary power. So you'll get a man or woman with superstrength and the power of flight. Or laser vision and flight. You get the idea. And then you get into a situation where somehow the super-being managed to get two powers at the same time, instead of just one. That's why flight is way too common, considering how unlikely it is for it to happen at all. Plus, they almost never explain how the super-being is able to fly, since they rarely have wings or any other mechanism of flight. Teleportation is a good power that hasn't gotten old, and Azrael in X-Men: First Class showed it's pretty formidable. 3. Invulnerability - This used to be called "bulletproof," but it's expanded to mean the super-being is impervious to any weapon. Of course, Superman is the greatest example of this power, and why invulnerability has kind of fallen out of favor in recent years. When you've established that nothing can hurt your hero, it kind of takes the tension out of his battles. That's why invulnerability has given way to its cousin, tissue regeneration, which is the ability to quickly heal from any injury. Natch, we're talking Wolverine, but also the Hulk and even Spiderman have it. Regeneration is a better power for drama, because you can throw all sorts of stuff at the hero, and there's still the chance of getting killed. Problem with tissue regeneration is that the tension is only slightly better than invulnerability, since the hero almost never actually dies. Let's just leave our heroes vulnerable, okay? I personally would like to see an issue where a superhero spends the month in the hospital. Eating Jell-O, flirting with nurses, watching TV, getting his bedpan changed...that's drama right there. 4. Energy Beams - Whether it comes out of your eyes like Cyclops, your chest like Havoc, or your kneecaps, the end result is the same. The super-being can shoot destructive energy beams out of their body with varying effects like burning or pushing stuff away or making things explode. It's a cool power, but it seems like a power that every other superhero has. I don't know about you, but I'm in the mood for something different. What about just the ability to instantly kill or blow up anything by looking at it? That would really raise the stakes. 5. Super-Intelligence - So far, the powers we've discussed have been mainly physical. There's also some mental powers that are overused. One is super-intelligence or a genius IQ. Usually this almost always means they're a scientific genius and build lots of gadgets. In thinking about it, I realized this power is actually more common among supervillains than superheroes. The few superheroes that do have genius intelligence are often mocked (ex. Mister Fantastic) or are nerds (ex. Spiderman). Of course, Tony Stark is the exception that proves the rule. I think this power could be unique if it was handled differently. What if the super was only a genius at math? Or physics? Or even a genius at management? Or arts like painting? There are all kinds of geniuses. Not everyone with a high IQ is building power-suits and death rays. Do you agree these powers are overused? Any other overused powers you can think of? Yep, you've pretty much nailed the most over-used powers of all. And what's sad is that many moons ago, these powers on a superhero would get the pulse racing as you read about whatever exploit they are going on about because they were just so bad-arse. But now....I'm like "Okay. *yawn* So, what else can they do?" They missed super speed though.